Replete with an en-suite bathroom, this guest room has one double bed and one single bed as well as a sofa bed that can be used to sleep two children. Here again, a weekend bed is available for toddlers. The room is furnished with a wardrobe, bookshelves, a table and armchair. The bathroom is fitted with a shower, sink and WC. The beds are covered with a duvet and deliciously soft sheets, while extra blankets and pillows are available in the cupboard. 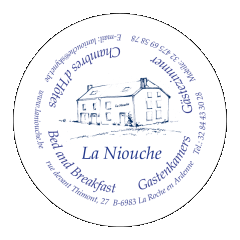 Customised towels bearing the logo of La Niouche, a hairdryer, soap, etc. are provided for your use in the bathroom. For your comfort, still and sparkling water await you in the room, along with tea and coffee-making facilities.